After five years of African community coverage, a reporter reflects, and speculates about the future. In the wake of the Great East Japan Earthquake of March 2011, Dreux Richard and The Japan Times Community section began working to assemble a detailed portrait of the country’s African community, including its elaborate network of civic organizations, the rapidly changing work lives of Japan’s African residents, their efforts to bring their native culture to their adopted home, and the families they’d started since arriving. After Joe Mitchell’s accounts of mid-century New York had entered the shared canon of journalism and literature, an interviewer asked him whether, in all the years since he’d stopped writing, he’d considered going back through his old work in search of his lost impulses. He replied that a reporter’s regrets — and he was certain that was all he’d find — are abundant, uninteresting and deserve the ignominious fate his had long ago earned: a few inches in newsprint. During the five years I spent pretending (or so I felt) to be a reporter in the pages of this newspaper, covering the African community, I developed two regrets I’ll commit to the same ignominy. In my early coverage I referred to African immigrants who solicit customers for nightclubs as “touts.” In a dictionary sense, this is correct. But in Nigeria, it’s pejorative, and it’s often misapprehended as the English translation of an inflammatory insult in a local dialect. I hadn’t been to Nigeria when I began my reporting; if I had, I would have known the word would become a distraction. Occasionally I meet members of the African community who are wary of my coverage based solely on my use of that word. To them, and to anyone who shares their sentiments, I apologize. 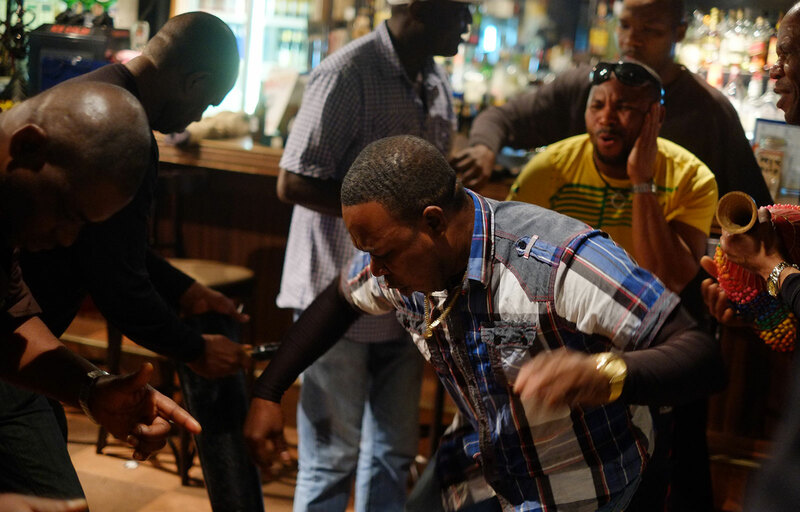 In 2013 I wrote about Gilbert Otaigbe, a Roppongi nightclub owner whose overnight success, subsequent battles with Tokyo law enforcement and eventual return to Nigeria had defined an era of nightlife entrepreneurism for African immigrants in the red light districts. The article contained information that Otaigbe’s contemporaries presented as evidence of his self-destructive slide toward cynicism and greed. Although the behaviors described by these sources were — and remain — Otaigbe’s responsibility, it was also true that law enforcement had acted in bad faith. Which is why I called the legal pretext for a raid on Otaigbe’s club “archaic” and paraphrased sources who believed his resulting bitterness was warranted. Still, I omitted details I now consider important: The police brought drug-sniffing dogs with them on the raid, and they brought television news crews, using the media to create the unfounded impression that Otaigbe was a drug kingpin; the raid became an ethnically charged publicity stunt. If Otaigbe hadn’t refused to be interviewed for my article, he might have chosen to describe the raid along those lines. In publishing a story that could affect his reputation, I owed him the inclusion of every mitigating detail he could rightfully have mentioned. Perhaps his reputation wasn’t affected. Web analytics indicate this story wasn’t read much. None of my African community coverage was, except the first article, in 2011, which generated enough traffic to convince my editor and me that readers would be interested in more. 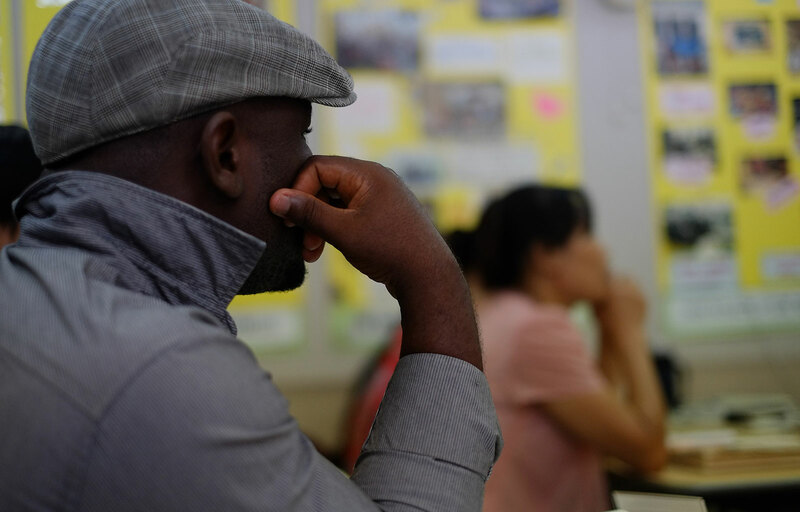 We set out with two goals in mind: The African community would be able to rely on The Japan Times to attempt to understand what the community considered important, then publish about it; and the resulting portrayal of the African immigrant experience in Japan would offer a more complex picture than previously published accounts had achieved. Among members of the African community, the first goal was the subject of mirth and gratitude alike. At Nigerian town union events in Tokyo I was often chuckled at — good-naturedly or otherwise — for dedicating years of work to such a small demographic. I was thanked less often, but regularly. The second goal we could hardly help but meet, since so little had been written before we began, except on crime in the nightlife districts — about spiked drinks and stolen credit cards. 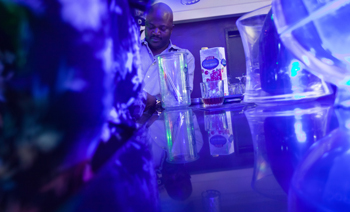 Gilbert Otaigbe props up the bar at his Abuja nightclub, 911 Black, in June 2013. 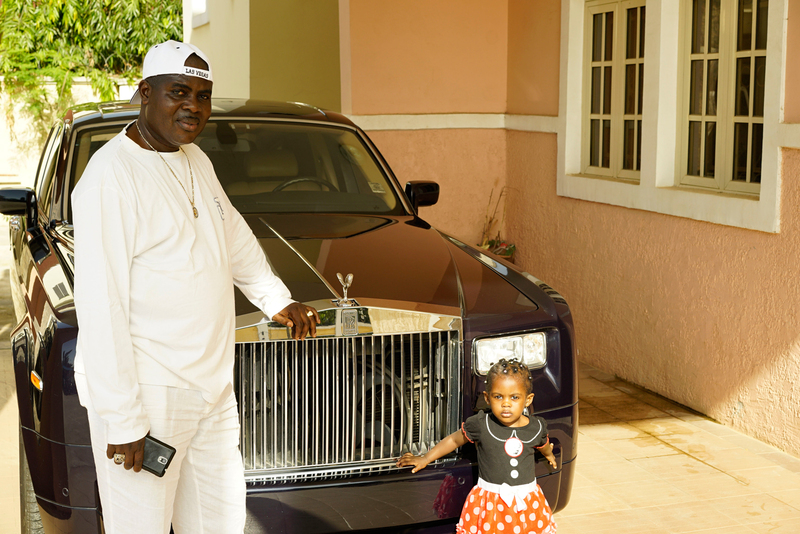 Darien, who returned to Nigeria when his former wife in Japan was pregnant — and who has never met his bi-ethnic daughter, Naomi Sato — poses with his youngest daughter at his home in Abuja. 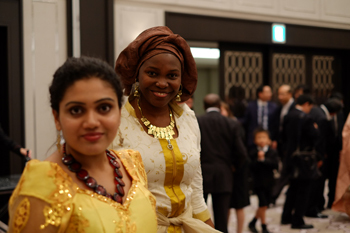 Elizabeth Onogwu, a native of Benue State in Nigeria and a doctoral candidate in anthropology at Yokohama National University, attends a celebration of Nigerian independence held by the Embassy of Nigeria in October 2014. The number of African students at Japanese universities is growing steadily, according to the government. However wryly my interlocutors may have regarded me, and in spite of readers’ tendency to overlook the accumulating coverage, certain of the stories’ subjects generated reactions from readers. In my first story, published shortly after the 3/11 disaster of 2011, a nightlife worker named Saint described the tsunami as divine retribution for Japan’s culture of racism. Saint had only been in Japan a few years, and had already been harassed — strip-searched, in fact — by police in the neighborhood where he lived, but the comment, made so soon after the disaster, was predictably controversial. Readers may be interested to know what became of Saint: He grew bored of working on the street and opened a hostess club, but found that he’d come to Japan a few years too late to profit the way some of the more experienced club owners had, unless he was willing to take advantage of vulnerable customers. He didn’t cross that line; of the many club owners I know in the red light districts, he’s one of only a few who, to my knowledge, never has. He was a meticulous churchgoer (his only leisure activity), and I watched him struggle — with the help of his pastor — to maintain his professional integrity after the patriarch of his extended family died in early 2014, making him the eldest employed male, and placing him under tremendous pressure to remit his earnings to Nigeria. He worked to meet these obligations by channeling his club’s profits back to Benin City, the capital of Edo State, where he renovated an apartment complex and began taking tenants, but this didn’t produce an adequate income. The last time I met with Saint he’d started sending cars and car parts to Nigeria, an often-profitable business that works best if one declines to ask suppliers how they obtain their merchandise. 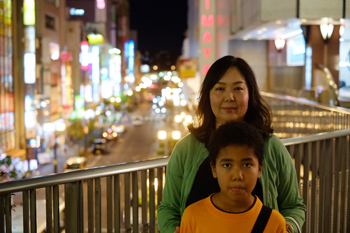 Yoko Igwilo, who relocated to Nigeria with her husband, Emeka, and their two sons in 2008, poses with her youngest son, Roy, during a visit to Japan in 2015. 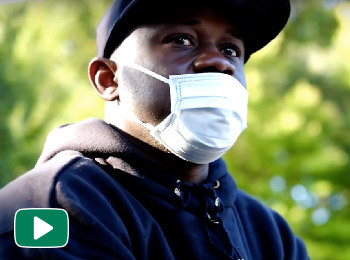 In a 2014 story about the socioeconomic gap that separates well-integrated African immigrants from their less-settled counterparts, I wrote about Liberian asylum applicant Simeon Conteh, who had narrowly escaped the Ebola epidemic in Monrovia and whose mother appeared to have died since his arrival in Japan. Simeon’s application for refugee status faced long odds, and he struggled with the unfamiliar tasks required to learn Japanese and build a life in Chiba. His story, published while Ebola continued to rage in Liberia and during a brief window when African arrivals to Japan — not the crisis in Syria — were driving the national dialogue about refugee recognition, elicited a strong response from readers. I last spoke to him in November 2015. His asylum application had not been reviewed yet. He’d been ill, and needed some minor surgery, but he was on the mend, and had recently started riding his bike again, allowing him to resume studying Japanese. We planned to meet a week later, before his Bible class. He never showed. I haven’t been able to reach him since, and nor have our mutual acquaintances. He wasn’t home when I visited his apartment, and his neighbors hadn’t seen him. I hope the fateful phone call did not come — that he wasn’t summoned to the Immigration Bureau in Shinagawa, notified that his application for refugee status had been rejected, and detained presumptively. Like other refugees from West Africa, he had expressed a fear that the September 2015 immigration overhaul — which included a pledge to fast-track “suspicious” asylum applications so that backlogs could be cleared and waiting times reduced — would play out along national boundaries, unfavorably for him. Some readers objected to my referring to an “African community” as the focus of my coverage. 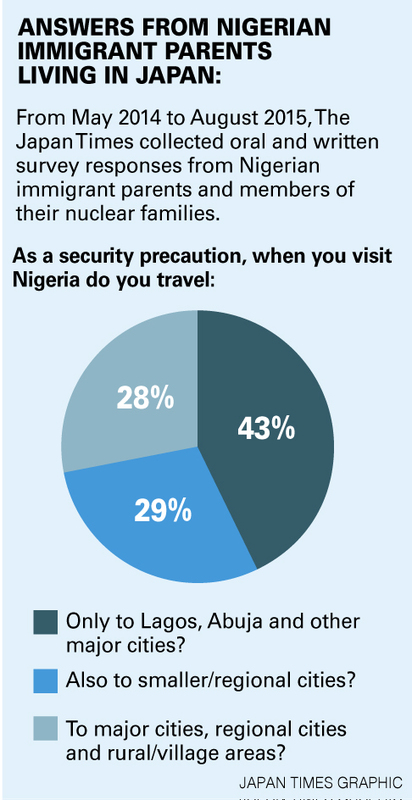 Primarily I wrote about Nigerians, since their civic organizations generate a news cycle. In making final mention of recent developments and guessing at what might come next, I yield to that criticism and limit myself to the Nigerian community. Autumn of 2014 saw the inauguration of the Japan chapter of the Indigenous People of Biafra, an ethnic nationalist organization which has proliferated in countries that host Igbo immigrants. IPoB agitates for an independent Biafran state in southeastern Nigeria. 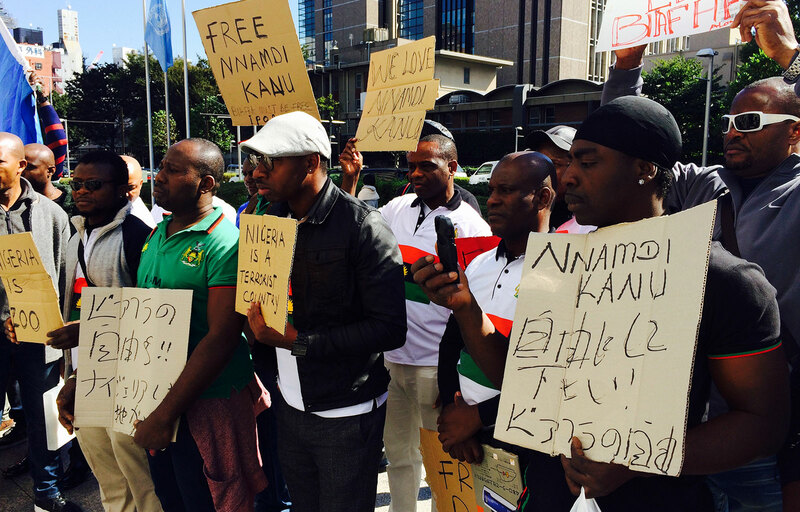 A handful of other Igbo nationalist groups have coalesced in Japan over the past two decades, but IPoB quickly eclipsed its predecessors in both membership and fundraising capacity. In September 2015, the organization’s global director, Nnamdi Kanu, visited Japan and drew 300 people to a fundraising event in Ikebukuro. Shortly thereafter he traveled to Nigeria and was imprisoned by Nigerian President Muhammadu Buhari. The dubious legality of his continued detention has invigorated the Japan chapter of IPoB and contributed to the rapid growth of its membership. In October of last year, members from Tokyo and Nagoya protested in front of the Embassy of Nigeria; a tense interaction with the acting ambassador included a threat by the Japan chapter’s chairman, Celestine Okeke, to “raze this building down” if Kanu’s detention continues. In part, IPoB’s future in Japan depends on its leadership’s ability to form productive relationships with existing Nigerian civic unions. Leaders in two of these unions had hoped to found a pan-Igbo organization of their own, and they privately regard IPoB’s rapid expansion as an unwelcome complication. It may not be a coincidence that IPoB Japan has achieved such swift strength concurrent to the renewed escalation of economic pressure on nightlife workers, who account for the majority of members. Most work in Shinjuku’s Kabukicho district, where the chapter held its first meetings and where the nightlife business’s continued decline — for African club owners especially — has been fastest. My perceptions, of course, are anecdotal and circumstantial, based on an informal survey of workers in each red light district to see how many had recently started looking for a day job. From September through November 2015, more workers in Kabukicho reported seeking day jobs than in the past 12 months combined. Reports of club closures and overdue paychecks also spiked. Since I began my coverage, the question of how long nightlife work can continue to provide income to a significant percentage of the Nigerian community has remained unsettled. The approach of the 2020 Tokyo Olympics poses stark possibilities. On Sept. 28, 2015, a handful of African nightclub owners attended an invitation-only meeting held for their benefit at Azabu Police Station, where they were reappraised of rules governing the conduct of street-level workers, and were told that few to none of those workers would be permitted to operate in Roppongi during the Olympics. Depending on the length of the prohibition and how it is enforced, some club owners fear it could drive many of the remaining African-owned nightlife establishments out of business. Nnamdi Kanu, global director of the Indigenous People of Biafra (IPoB), speaks at a post-fundraiser celebration in Tokyo in September 2015. The number of Nigerian immigrants who have lived in Japan for more than a decade has increased, and so has the number who have returned to Nigeria or who now divide their time between Nigeria and Japan. Returnees’ motivations are diverse, but some related phenomena are discrete. For instance, the concentration of returnees from Japan in Festac, one of the few affordable Lagos neighborhoods also regarded — by Igbo in particular — as an intelligent place to build equity or open a business. In May 2015 I spent six days in Festac reporting on returnees’ children. Before I left, I’d stumbled into three of my sources from Japan on the street, on separate occasions, none of whom I’d known were in Nigeria. 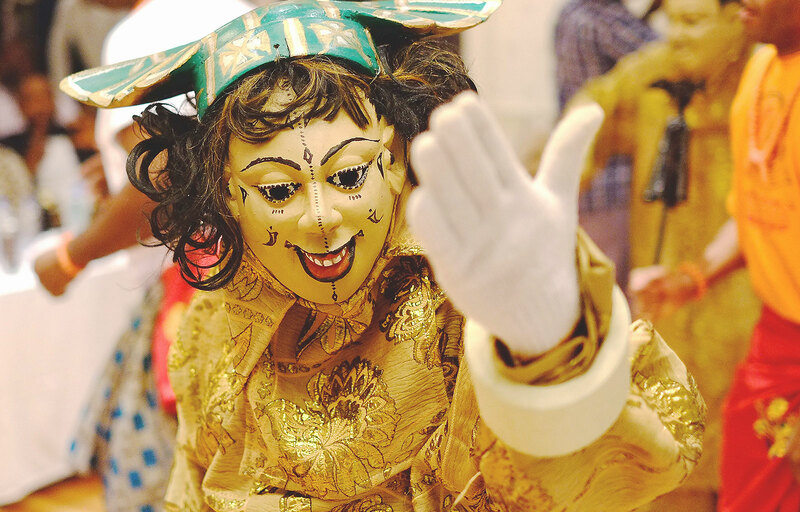 Readers may remember Chairman Tony Ikeotuonye of the Anambra State Union, the protagonist in a 2013 story about the union’s ambitions — ultimately realized at the Tokyo International Conference on African Development — to stage a Nigerian masquerade in Japan. 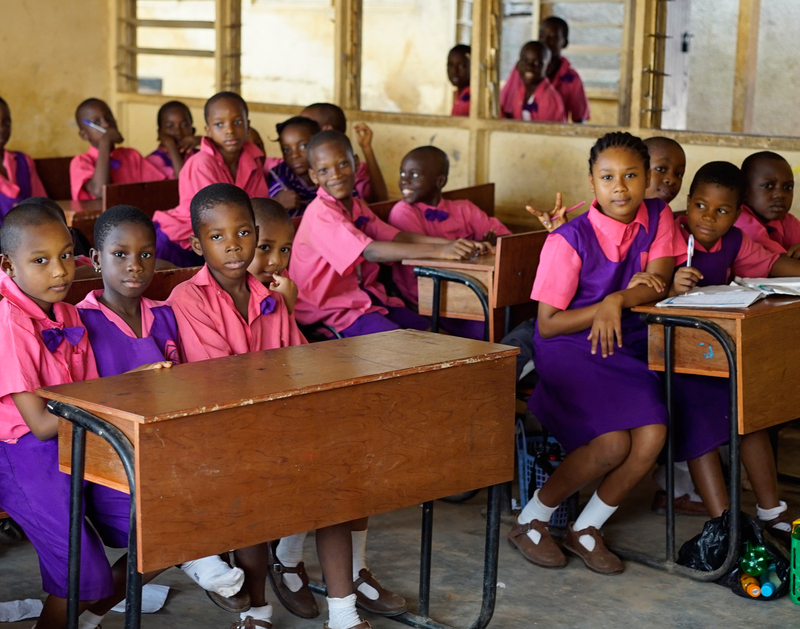 Even in 2013, Tony was already balancing the challenges of union leadership with a life he’d begun to build in Nigeria, where he had remarried, and where he’d moved his bi-ethnic children (from his previous marriage in Japan) so they could attend school in English. He was living in Festac and building a hotel there, piecing together the necessary investment capital along the way. When the Anambra State Union held its 2015 elections, Ikeotuonye — who had run for re-election — remained in Nigeria, forfeiting his bid. His son was about to start college, his wife was pregnant and the hotel project wasn’t going to progress without direct supervision. Perhaps other Nigerians will make similar decisions in the future, and Festac will be the place to observe the results. The Anambra State Union inaugurated its new chairman, Austin Nnajiofor, at its year-end party in November, the final Nigerian community event I attended as a reporter. 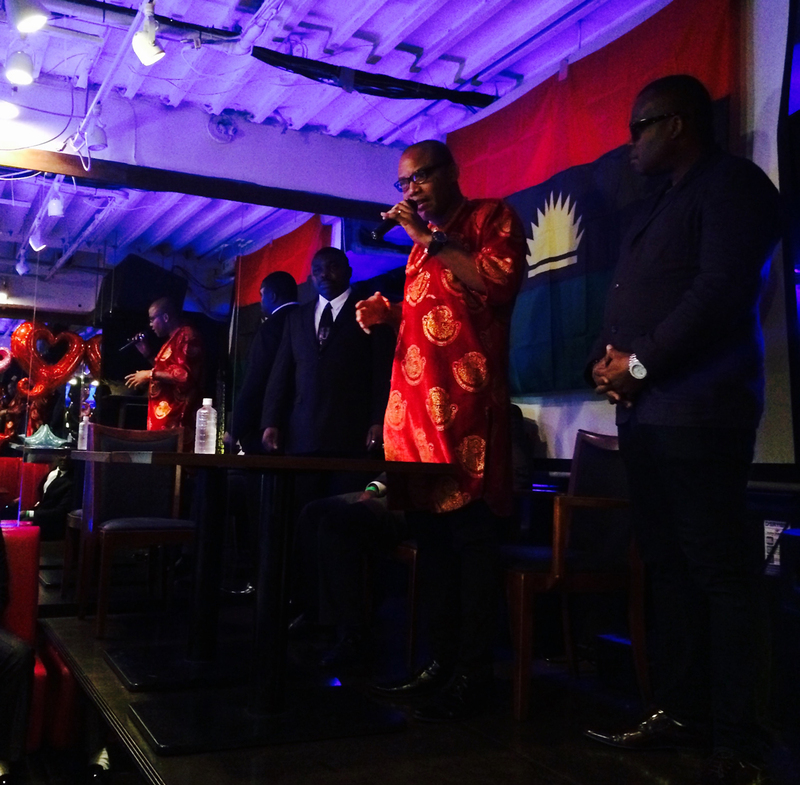 IPoB’s rapid expansion was a popular topic among guests, and several of its supporters were seated at the high table. Recent organizing successes by the Abia State Union were also much-discussed. 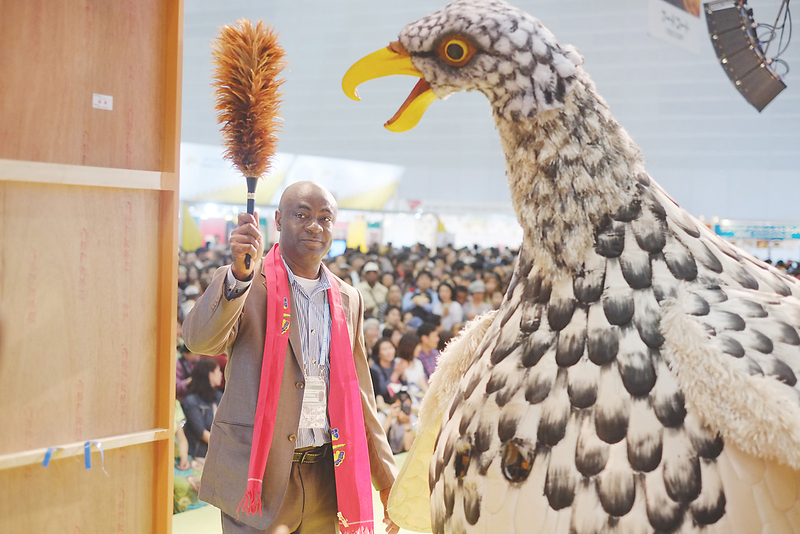 Abia’s has long been the smallest of the Igbo unions in Japan, but newly elected Chairman Eme Obasi has positioned his organization for expansion, setting a new high watermark for fundraising and hosting the union’s first major events for several years. 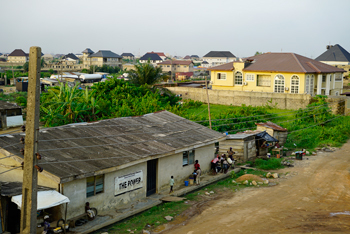 Although fewer immigrate to Japan from Abia than Imo or Anambra states, Abia natives are probably the largest group of Nigerian expatriates yet to be thoroughly organized under the town union system, so Obasi’s achievements, if they attract enough constituents, could set the stage for a significant expansion of Igbo civic activity. As could the atmosphere of political rapprochement that accompanied the celebration. When I began my reporting, Nigerian civic activity was characterized by a triangular conflict between the leadership of the Nigerian Union (an umbrella organization) and the two largest state unions, Imo and Anambra. It was difficult to recall that conflict at Anambra’s 2015 year-end party; the Imo State Union had invited the former chairman of the Nigerian Union, who they’d once worked to undermine, to chair its own celebration earlier in the month. It was the first year-end party I’d attended in the five years I’ve been going where rumors of infighting and rivalry were not on most attendees’ lips. VIDEO: Two sides: Two immigrants to Japan who have now returned to Nigeria to raise their children speak about their experiences parenting in both countries. 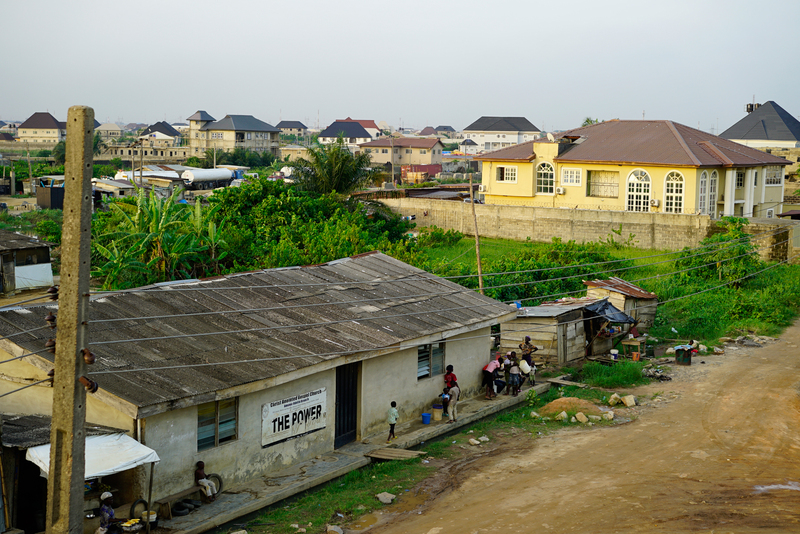 A view of new construction in the Festac neighborhood of Lagos, where many returnees from Japan have chosen to build homes and businesses. Emanuel’s three oldest children pose for a photo in Benin City, Nigeria, with their classmates. While the children live with Emanuel in Nigeria, his youngest daughter resides with his ex-wife — the mother of all four children — in Japan. Emanuel recently won a lawsuit in Japan that granted him child support, compensatory damages and monthly visitation with his daughter. Legal experts believe he may be the first African plaintiff to obtain a favorable judgment in this type of case. After five years of coverage, many of the year-end party’s attendees were fondly known to me. I was amused to find myself standing next to a gentleman whose son’s christening I’d covered in 2011, and to realize he no longer recognized me. I also ran into Chuks, a former chop shop employee I’d last seen in 2014, when he’d just been released from prison. His wife — a Japanese national with whom he had two young children — had stood by him through his year of incarceration, but he’d emerged from prison convinced he could only be happy in Nigeria, intending to marry there, and insisting his wife would permit it if he explained his reasons carefully. At the year-end party I learned he’d abandoned that plan, never mentioned it to his wife, and had committed himself to rebuilding his life in Tokyo. Iron Must Obey was there, too — the scam artist I wrote about in 2014 after he stole wages from a crippled Cameroonian refugee applicant, surprising even his friends, who usually found his choice of marks oddly honorable. Of course, there’s more to Iron Must Obey’s story than made its way to the page. He is arguably the shrewdest containerization entrepreneur (i.e., exporter of miscellaneous goods) in the Nigerian community, and the only one who brought an intimate knowledge of the business — widely aspired to by Nigerians in the diaspora — with him to Japan. That he’s mostly a con artist now is the result of a difficult family drama and the toll it has taken on him. He showed up to the party in his newest disguise, wearing a clerical collar, fooling no one who has ever met him before, and not minding at all, since there were so many recent arrivals to Japan in attendance, all of them looking to get ahead, few of them knowing who to trust. Long-term Nigerian residents of Japan generally feel that the number of migrants of economic opportunity arriving from Nigeria is rising again. Whether they’re right or they’ve been influenced by media narratives about Japan’s demographic crisis, I can’t say, and immigration statistics don’t suffice. I can offer this much: Three of my returnee friends in Nigeria who continue to conduct business in Japan have recently been approached (separately) by Japanese contacts offering a commission for every cost-effective laborer — legal or otherwise — they can deliver to a work site. They say their Japanese contacts are anticipating the Olympic construction boom. What makes Nigerian migrant labor distinct from some of the other migrant labor in Japan is the sophistication of the broker network in Nigeria: Japanese entry visas (among others) have been sold in Lagos and Abuja for decades, and brokers’ contacts in Japan quickly channel new arrivals to work sites. Though the flow of migrants to Japan from Nigeria remains modest, a good contact in Nigeria can prove more reliable than a contact elsewhere, and it can provide laborers who are inured to difficult work conditions, an attractive prospect for small and medium-size construction contractors. If the Olympic construction boom and the decline in Japan’s labor pool creates a side-demand for migrant labor from Nigeria, it’s difficult to say what effects this might have on the broader phenomenon of backdoor migration to Japan. Many of my most thoughtful interview subjects are convinced that this question — and how the Nigerian community positions itself in relation to this issue — will define the next five years of Nigerian diaspora politics in Tokyo. 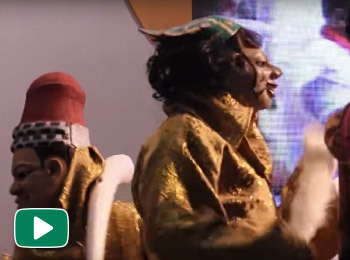 VIDEO: The Anambra State Union’s cultural troupe brings the colorful tradition of masquerade to their adopted home for the first time. 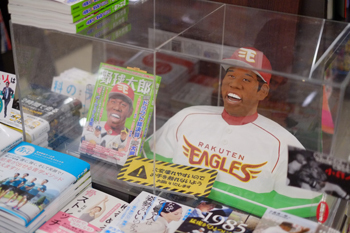 A bust of the Rakuten Eagles’ Rui Okoe on display at Books Sanseido in Jinbocho, Tokyo. Okoe’s father is a long-time friend of many Nigerian community leaders, and Okoe’s success has led many members of the community to begin following baseball. Anambra State Union Chairman Tony Ikeotuonye is flanked by the Ugo as he brings his troupe's performance at the Africa Fair in Yokohama in June 2013 to a close.